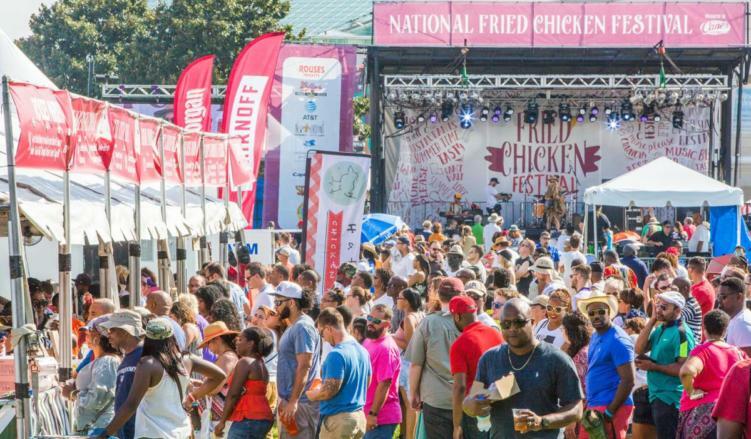 The National Fried Chicken Festival is back this weekend and we’re already prepping our stomachs. The FREE festival, presented by Raising Cane’s, is a two-day chicken extravaganza, complete with activities and musical performances. Come check everything out this Saturday (11am-9pm) and Sunday (11am-8pm) at Woldenberg Riverfront Park in New Orleans. This festival gives everyone the avenue to be super creative with their chicken dishes, and it certainly shows! Chicken lovers of all kinds can indulge in massive pieces of fried chicken, to po-boys and tacos! For vegetarians and vegans, there are options for you as well! Atlas Monroe’s plant-based “fried chicken” dishes will be in attendance, along with side dishes (mac & cheese, fries, etc) from vendors. For a full list of participating restaurants, click here! For those not wanting to miss out on Saturday and Sunday football, don’t fret! Games will be showcased at the Direct TV Football Fan Zone. For those wanting to enjoy their chicken with a side of live music, you’re also in luck. Check out performances by Mannie Fresh, Amanda Shaw, Flow Tribe, and more! VIP is also an option for those wanting a little first-class experience. To grab tickets for VIP and learn more about what it includes, click here. Bring your chicken game faces on! We will see you out there!